Welcome Back to hackerwalablog, like always today i have come up with new loot offer, yes this app is not new and many of you probably used it before and for who haven't just read on. Earn Talktime is a very famous recharge app, it is like mcent or taskbucks , paying you for completing task. currently they are offering a refer and earn task. 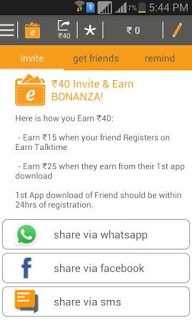 When you refer a friend to Earn Talktime App you will Earn Rs 40. Rs 15 when they register to Earn Talktime app and Rs 25 when they complete at least one offer in earn talktime android app. Sign up with your mobile no and verify OTP. Now Go to menu >> Invite Friend and start inviting your friend.